For many small development shops, the idea of using TFS and a centralized source control repository is anathema. The mere thought of being restricted by a software configuration manager on how and when to branch or merge cuts against everything they cherish in software development. Git is their natural and chosen ground for managing source code. The freedom and flexibility of using Git enables them to work where they are. This is especially true if they are working as part of a distributed team on modular projects. Microsoft addressed many of the existing concerns with TFS source control with the advent of TFS 2012 and local workspaces. However, even though local workspaces enable great flexibility in offline work, they are still ultimately tied to a central repository and the policies and restrictions imposed on it. Enter Git support in TFS. Git support currently comes in two forms; stand alone Git support in Visual Studio and Git support with TFS. Git support with Visual Studio is completely straightforward. Simply change the source control plug-in selection to the Microsoft Git Provider and all the power and flexibility of Git is available to the Visual Studio developer such as private branches and online collaboration with Git hosts such as GitHub and BitBucket. 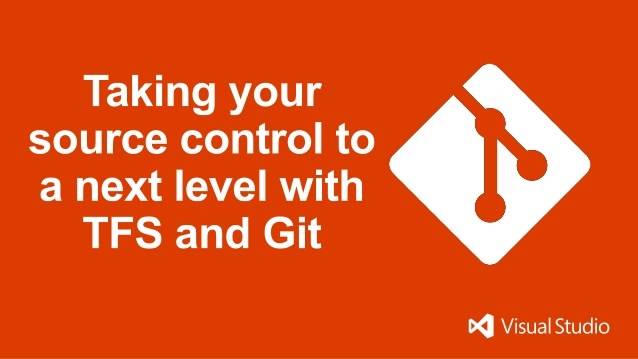 However, from an ALM perspective, the real power and the compelling feature of Microsoft’s integration with Git is the ability to work with TFS. Developers still get all the advantages and flexibility of Git, but can also take advantage of the ALM features of TFS such as work item tracking, team tools and integrated build. The Git – TFS integration gets us much closer to the ultimate goal of true cross-platform support in a single ALM toolset. The TFS – Git integration can be utilized a couple of ways. The first option is the ability to essentially synchronize a Git repository with TFS source control with the Git-TF utility. This utility makes it easy to clone sources from TFS, fetch updates from TFS and push changes back to TFS. What’s more, it fully supports TFS shelvesets and work item integration, which presents some exciting possibilities. The features and functionality Git-TF provides makes it a compelling solution and a credible compromise between centrally managed teams with source control and distributed teams with distributed source control. The second option, available now only through Microsoft’s hosted TFS Service, is the ability for organizations to create TFS Team Projects with Git hosted source control (this ability is reportedly planned for on premise TFS support in the next release). This is a fairly exciting development. Having the choice between native TFS version control and Git when creating a team project opens many doors that hitherto were locked shut. Eclipse, XCode, Visual Studio and any other IDE that supports Git can now be used to leverage the powerful ALM features TFS provides. As an ALM consultant, that’s the part that excites me the most. Hosting all development efforts in a single environment; an environment that supports all the various technologies in play and being able to track and manage those efforts with agility and transparency is a huge benefit to any organization that provides multiple platform solutions. Even those who don’t, will now have the option to at least evaluate the feasibility of utilizing TFS in development environments not typically associated with a Microsoft project. The mythical promised land of cross-platform ALM may have just become quite less mythical. The Git-TF tool is most easily used by a single developer or multiple developers working independently with their own isolated Git repos. That is, each developer uses Git-TF to clone a local repo where they can then use Git to manage their local development that will eventually be checked in to TFS. In this “hub and spoke” configuration, all code is shared through TFS at the “hub” and each developer using Git becomes a “spoke”. Developers looking to collaborate using Git’s distributed sharing capabilities will want to work in a specific configuration described below. Most often, developers collaborating with Git have cloned from a common repo. When it comes time to share divergent changes, conflict resolution is easy because each repository shares the same common base version. Many times, conflicts are automatically resolved. One of the keys to this merging of histories is that each commit is assigned a unique identifier that is generated by the contents of the commit. When working with Git-TF, two repositories cloned from the same TFS path will not have the same commit IDs unless the clones were done at the same point in TFS history, and with the same depth. In the event that two Git repos that were independently cloned using Git-TF share changes directly, the result will be a baseless merge of the repositories and a large number of conflicts. For this reason, it is not recommended that teams using Git-TF ever share changes directly through Git (i.e. using git push and git pull). Using the git tf clone command, Alice clones a path from TFS into a local Git repo. Next, Alice uses git push to push the commit created in her local Git repo into the team’s shared Git repo. Bob can then use git clone to clone down the changes that Alice pushed. Charlie can also use git clone to clone down the changes that Alice pushed. Both Bob and Charlie only ever interact with the team’s shared Git repo using git push and git pull. They can also interact directly with one another’s repos (or with Alice’s) , but should never use Git-TF commands to interact with TFVC. When working with the team, Alice will typically develop locally and use git push and git pull to share changes with the team. When the team decides they have changes to share with TFS, Alice will use a git tf checkin to share those changes (typically a git tf checkin –shallow will be used). Likewise, if there are changes that the team needs from TFVC, Alice will perform a git tf pull, using the –merge or –rebase options as appropriate, and then use git push to share the changes with the team. Note that (until Issue 77 is addressed) all changes coming into the TFVC repository will come in as if from Alice’s TFS identity. This is fine if only Alice has an identity on that TFVC project but it may well not be what you want if Bob and Charlie also had valid identities in that TFS project. Once changes have been fetched from TFS using git tf pull (or git tf fetch), those changes must either be merged with the HEAD or have any changes since the last fetch rebased on top of FETCH_HEAD. Git-TF allows developers to work in either manner, though if the repo that is sharing changes with TFS has shared any commits with other Git users, then this rebase may result in significant conflicts (see The Perils of Rebasing). For this reason, it is recommended that any team working in the aforementioned team configuration use git tf pull with the default –merge option (or use git merge FETCH_HEAD to incorporate changes made in TFS after fetching manually). When using the Git-TF tools, there are a few recommended settings that should make it easier to work with other developers that are using TFS. Git has a feature to allow line endings to be normalized for a repository, and it provides options for how those line endings should be set when files are checked out. TFS does not have any feature to normalize line endings – it stores exactly what is checked in by the user. When using Git-TF, choosing to normalize line endings to Unix-style line endings (LF) will likely result in TFS users (especially those using VS) changing the line endings back to Windows-style line endings (CRLF). As a result, it is recommended to set the core.autocrlf option to false, which will keep line endings unchanged in the Git repo. TFS does not allow multiple files that differ only in case to exist in the same folder at the same time. Git users working on non-Windows machines could commit files to their repo that differ only in case, and attempting to check in those changes to TFS will result in an error. To avoid these types of errors, the core.ignorecase option should be set to true. provides an overall view of how the system is used. 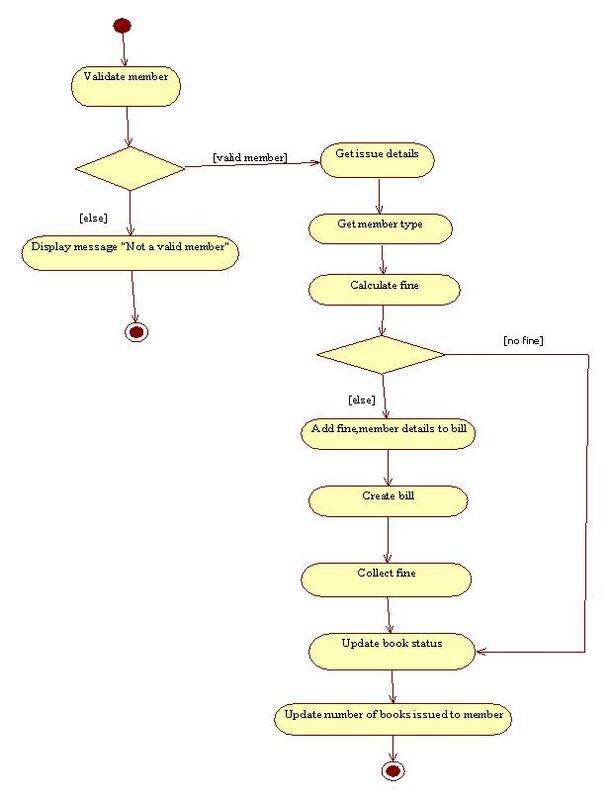 activity diagram showing the major tasks that a user will perform with the software application. use case. Figure 14-3 shows an example of a sequence diagram. to as a conceptual class diagram. Figure 14-5 shows an example of a class diagram. You can export a UML document from Visual Studio to an image that is under program control. For example, you might want to do this as part of automatic document generation. If you want to export a document to an image manually, you can copy and paste the shapes from a diagram into other programs such as Word. You can also print documents to XPS format. For more information, see Export Images of Diagrams. The following code defines a shortcut menu command, also known as a context menu command, that saves an image to a file. To make this code work as a menu command, you must incorporate it into a MEF component. For more information, seeHow to: Define a Menu Command on a Modeling Diagram. The code first uses GetObject<T> to get the Diagram of the underlying implementation. This type has a methodCreateBitmap. /// Called when the user clicks the menu item. // Get the diagram of the underlying implementation. /// Called when the user right-clicks the diagram. /// Set Enabled and Visible to specify the menu item status. /// Ask the user for the path of an image file. /// Return the appropriate image type for a file extension. Fabric in Windows Azure Platform: A Simplistic, Yet Remarkable View of Cloud In cloud computing, fabric is a frequently used term. It is nevertheless not a product, nor a packaged solution that we can simply unwrap and deploy. Fabric is an abstraction, an architectural concept, and a state of manageability to conceptually denote the ability to discover, identify, and manage the lifecycle of instances and resources of a service. In an oversimplified analogy, fabric is a collection of hardware, software, wiring, configurations, profiles, instances, diagnostics, connectivity, and everything else that all together form the datacenter(s) where a cloud is running. While Fabric Controller (FC, a terminology coined by Windows Azure Platform) is also an abstraction to signify the ability and designate the authority to manage the fabric in a datacenter and all intendances and associated resources supported by the fabric. As far as a service is concerned, FC is the quintessential owner of fabric, datacenters, and the world, so to speak. Hence, without the need to explain the underlying physical and logical complexities in a datacenter of how hardware is identified and allocated, how a virtual machine (VM) is deployed to and remotely booted form bare-metal, how application code is loaded and initialized, how a service is started and reports its status, how required storage is acquired and allocated, and on and on, we can now summarize the 3,500-step process, for example, to bring up a service instance in Windows Azure Platform by virtually saying that FC deploy a service instance with fabric. Fundamentally a PaaS user expects is a subscribed runtime (or “platform” as preferred) environment is in place so cloud applications can be developed and run. And for an IaaS user, it is the ability to provision and deploy VMs on demand. How a service provider, in a private cloud setting that normally means corporate IT, makes PaaS and IaaS available is not a concern for either user. As a consumer of PaaS or IaaS, this is significantly helpful and allows a user to focus on what one really cares, which is a predictable runtime to develop applications and the ability to provision infrastructure as needed, respectively. In other words, what happens under the hood of cloud computing is collectively abstracted and gracefully presented to users as “fabric.” This simplicity brings so much clarity and elegance by shielding extraordinary, if not chaotic, technical complexities from users. The stunning beauty unveiled by this abstraction is just breathtaking. Clearly the magnitude and complexities are not on the same scale comparing the fabric in Windows Azure Platform in public cloud and that in VMM 2012 in private cloud. Further there are also other implementation details like replicating FC throughout geo-disbursed fabric, etc. not covered here to complicate the FC in Windows Azure Platform even more. The ideas of abstracting those details not relevant to what a user is trying to accomplish are nevertheless very much the same in both technologies. In a sense, VMM 2012 is a FC (in a simplistic form) of the defined fabric consisting of Servers, Networking, and Storage pools. And in these pools, there are functional components and logical constructs to collectively constitute the fabric of a private cloud. This pool embodies containers hosting the runtime execution resources of a service. Host groups contains virtualization hosts as the destinations where virtual machines can be deployed based on authorization and service configurations. Library servers are the repositories of building blocks like images, iso files, templates, etc. for composing VMs. To automatically deploy images and boot a VM from bare-metal remotely via networks, pre-boot execution environment (PXE) servers are used to initiate the operating system installation on a physical computer. Update servers like WSUS are for servicing VMs automatically and based on compliance policies. For interoperability, VMM 2012 admin console can add VMware vCenter Servers to enable the management of VMware ESX hosts. And of course, the consoles will have visibility to all authorized VMM servers which forms the backbone of Microsoft virtualization management solution. In VMM 2012, the Networking pool is where to define logical networks, assign pools of static IPs and MAC addresses, integrate load balancers, etc. to mash up the fabric. Logical networks are user-defined groupings of IP subnets and VLANs to organize and simplify network assignments. For instance, HIGH, MEDIUM, and LOW can be the definitions of three logical networks such that real-time applications are connected with HIGH and batch processes with LOW based based on specified class of service. Logical networks provide an abstraction of the underlying physical infrastructure and enables an administrator to provision and isolate network traffic based on selected criteria like connectivity properties, service-level agreements (SLAs), etc. By default, when adding a Hyper-V host to a VMM 2012 server, VMM 2012 automatically creates logical networks that match the first DNS suffix label of the connection-specific DNS suffix on each host network adapter. In VMM 2012, you can configure static IP address pools and static MAC address pools. This functionality enables you to easily allocate the addresses for Windows-based virtual machines that are running on any managed Hyper-V, VMware ESX or Citrix XenServer host. This feature gives much room for creativities in managing network addresses. VMM 2012 also supports adding hardware load balancers to the VMM console, and creating associated virtual IP (VIP) templates which contains load balancer-related configuration settings for a specific type of network traffic. Those readers with networking or load-balancing interests are highly encouraged to experiment and assess the networking features of VMM 2012. With VMM 2012 admin console, an administrator can discover, classify, and provision remote storage on supported storage arrays. VMM 2012 uses the new Microsoft Storage Management Service (installed by default during the installation of VMM 2012) to communicate with external arrays. An administrator must install a supported Storage Management Initiative – Specification (SMI-S) provider on an available server, followed by adding the provider to VMM 2012. SMI-S is a storage standard for operating among heterogeneous storage systems. VMM 2012 automates the assignment of storage to a Hyper-V host or Hyper-V host cluster, and tracks the storage that is managed by VMM. Notice that storage automation through VMM 2012 is only supported for Hyper-V hosts. Aside from public cloud, private cloud, and something in between, the essence of cloud computing is fabric. And when it comes to a private cloud, it is largely about constructing/configuring fabric. VMM 2012 has laid it all out what fabric is concerning a private cloud and a prescriptive guidance of how to build it by populating the Servers, Networking, and Storage resource pools. I hope it is clear at this time that, particularly for a private cloud, forming fabric is not a programming commission, but one relying much on the experience and expertise of IT pros in building, operating, and maintaining an enterprise infrastructure. It’s about integrating IT tasks of building images, deploying VMs, automating processes, managing certificates, hardening securities, configuring networks, setting IPsec, isolating traffic, walking through traces, tuning performance, subscribing events, shipping logs, restoring tables, etc., etc., etc. with the three resource pools. And yes, it’s about what IT professionals do everyday to keep the system running. And that brings us to one conclusion.